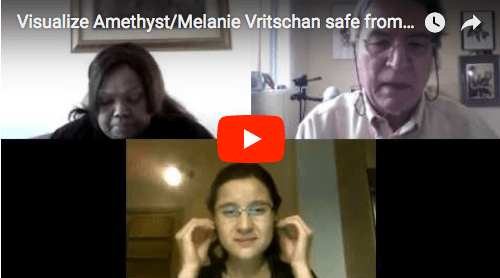 In an Oct 22 webinar hosted by Alfred Lambremont Webre of Newsinsideout.com with Dr. Katherine Horton, high-energy physicist and former CERN scientist, and attended by JIT members Dr. Millicent Black and Ramola D, further details emerged in the story of how L’Hopital Erasme has subjected ICATOR founder and renowned human rights advocate Melanie Vritschan to a succession of traumas as they removed her newborn from her care, subjected her to a late-night interrogation without painkillers one day after her Ceasarean delivery, locked her up in a psychiatric ward room in a different building, and then involved the State prosecutor, the Procureur du Roi, to issue a state order to separate her from her baby. Around the time of the birth, a team of four psychiatrists at Hopital Erasme seemed to swing into action shortly after Dr. Horton had a conversation with a nurse-midwife about an implant partially retained in Melanie Vritschan’s throat and causing her difficulty in breathing during anesthesia. Dr. Horton had clearly indicated part of this implant was indeed removed from Ms. Vritschan and scientifically analyzed. Mis-attributing Dr. Horton’s words to Ms. Vritschan and extrapolating from an educative and generalized statement Dr. Horton had made about various modern implant technologies such as in-ear microchip transmitters being used covertly on victims currently to mimic voices in heads, psychiatrists swung into action, claiming that Ms.Vritschan had mentioned implants and voices, had herself asked to be psychiatrically evaluated, and therefore needed a psychiatric evaluation. On conversation with Ms. Vritschan, this was found to be untrue. In fact, in Catch 22 fashion, Ms. Vritschan had been threatened with forceful removal of her person to be psychiatrically assessed if she did not permit psychiatrists to assess her without coercion. “She was clearly coerced anyway,” said Dr. Horton. When informed by Ms. Vritschan of the validity of Dr. Horton’s statement regarding implant-removal, and when shown physical evidence in documents and photographs on Ms. Vritschan’s laptop, the psychiatrists refused to listen and refused to look. In fact, in the later presence of police, a police officer who was shown the evidence requested that the psychiatrist be shown the evidence—which the psychiatrist refused to look at. This fact cannot be stressed clearly enough: hospital psychiatrists failed to act like medical doctors or scientists, refusing to look at, assess, and understand clear and present evidence of implant-removal, but claimed that Ms. Vritschan was delusional by way of a “delusional belief in being implanted” and needed a psych evaluation. Evidence of intentional foul play is also suggested by the fact that Dr. Horton was astonishingly evicted from the Maternity Ward room on Oct 19 where she was intending to stay overnight to assist Melanie Vritschan, by staff who informed her it was hospital policy to not permit guests to stay in the hospital when the baby was not in the room. When Dr. Horton questioned this policy, pointing out she was acting in the capacity of companion to Ms. Vritschan, and was there for the mother just as much as for the baby, staff brought in three burly security guards in an obvious act of intimidation and stated they would physically evict her if she did not leave. Later that evening, after Dr.Horton had left, police were called in and Ms. Vritschan was moved against her will across Brussels to another hospital, Hospital Brugman, to be interrogated CIA rendition-style at midnight for over two hours by another psychiatrist, and then confined like a criminal to a psychiatric jail cell with no toilet and only a low bed with straps, of the kind used to restrain violent psychiatric patients. The upshot of the rendition-assessment, it turns out, was positive; the psychiatrist who conducted the interrogation stated there was “nothing wrong” with Melanie Vritschan and that she needed to be returned to the Maternity Ward. The psychiatrist then received a couple of telephone calls and changed his tune; now, he said, Ms. Vritschan needed to be returned to the Psychiatric Ward. Had the doctor—supposedly the hospital authority to determine a patient’s psychiatric condition–just heard from the political pipeline from the Attorney-General’s office and thereby been persuaded to change his medical opinion completely? It should be noted that Ms. Vritschan is currently engaged in bringing a class-action lawsuit against the State seeking redress for the actions of covert implantation and harassment brought against her and many other victims in Belgium. Alfred Lambremont Webre, International War Crimes judge and expert in international law, has provided an affidavit for this lawsuit. Were the current actions taken by Erasme Hopital and the Attorney-General’s office to dismiss her as delusional and steal her child thinly-disguised retaliation and attempt to obstruct this lawsuit? It would appear so. Thanks to dozens of calls made to the Psychiatric ward following the previous press release, the hospital has been made aware of the international attention drawn to this scandal. However the latest from this seeming bastion of fascism is that the hospital is curtailing all visitation rights for this mother who has already been traumatized by the separation of the baby, and not permitting anyone to visit her over the next two days, citing disruption caused by visitors. The hospital is also denying Melanie Vritschan access to her own medical records. It should be noted as well that the false diagnoses of delusions pronounced by the psychiatrists who deliberately refused to examine scientific evidence completely contradicting their diagnoses were used as excuse for the separation of the child from the mother. There was no evidence whatsoever of malfeasance or ill-treatment of the child by the mother—in other words, no legitimate reason whatsoever to separate the child from the mother. This entry was posted in Activism, covert implants, Waking Up and tagged Alfred Lambremont Webre, Amethyst Vritschan, Christine Rottiers, Directeur-General, Dr. Katherine Horton, Dr. Millicent Black, Erasmus Hospital, Gynecologie, Hopital Erasme, JIT, Johan Kips, Medical Kidnapping, Melanie Vritschan, Newborn Baby, psychiatry, Ramola D, Separated from mother, Webinar. Bookmark the permalink.